When Market Bar-B-Que co-owner Anthony Polski announced in May that his landmark restaurant — barbecue pit and all — was relocating from Eat Street to northeast Minneapolis, he wasn’t ready to reveal the exact location. He is now. 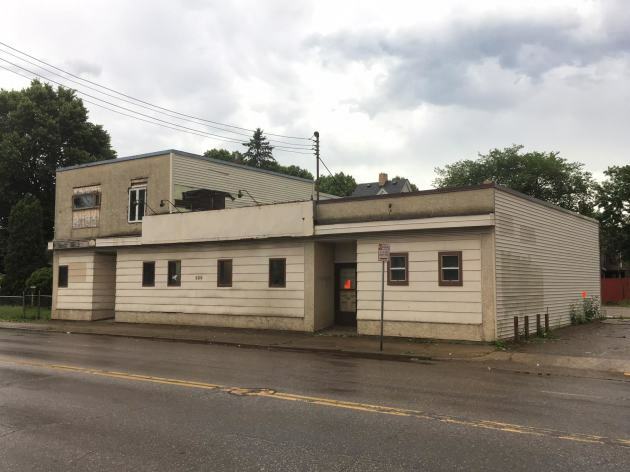 Polski and his father and business partner Steve Polski have purchased an abandoned liquor store at 220 Lowry Av. NE., and have some serious plans for sprucing up and expanding the 1906 structure. (That's the property, pictured, below). The Market’s future home is in good company, located within a few blocks of Stanley’s Northeast Bar Room, Marina Grill & Deli, Gasthof Zur Gemutlichkeit, Crepe & Spoon, Hai Hai, Grumpy’s Bar & Grill and Jax Cafe. Construction is set to start July 1st, and the new location — the restaurant’s fourth in its 72-year history — should be up and running in mid-November. The project's design is the work of Blumentals/Architecture in northeast Minneapolis. The restaurant’s current location (1414 Nicollet Av. S.) will close in September, at a date to be announced. The Polskis are moving their business to make room for a 239-unit apartment building. Their neighbors, Asian Taste, Ryan’s Pub and Salsa a la Salsa, are also losing their locations. One detail that's definitely making the move is the Market's flashy, familiar sign (pictured, above), which will add some pizzazz to Lowry Avenue.